Did you know that your Nintendo DS and DS lite can play back movies, videos, mp3 music, and even let you read ebooks - and MORE? 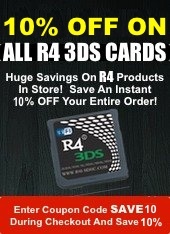 While these features are not available in your Stock DS or DS Lite system, the R4 DS Card makes everything possible. From putting full length movies on your DS, to reading the newest digital comics. It is easy, once you have the R4 DS Card. The original R4 DS enabled you to use micro sd cards up to 2GB. With the R4 SDHC version, the updated R4 card, you are able to take that much futher, with support for micro sdhc cards up to 8 or 16GB in size, you will have an endless amount of storage space for all of your DS homebrew games and applications. The R4 SDHC brings all of the same functionality you have come to rely upon from the R4 Card, and updates it with more storage and newer firmware files. All of our R4 products are fully Wood R4 Compatible, and you'll be able to play all of the latest software with ease. 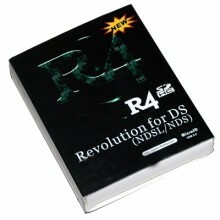 If 2Gb memory is more than enough for you, then the original R4 DS will suit you just fine. If you would however like to add even more storage, we suggest you give the R4 SDHC card a try. 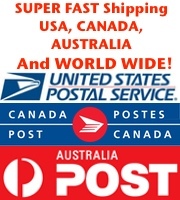 All of our products come with a full 1 year warranty and lifetime firmware updates - free of charge!